Can dogs eat french fries? You probably ask this question if you want to share a treat from the drive-thru with your pooch. Most humans can eat french fries once in a while, so can dogs have them, too? 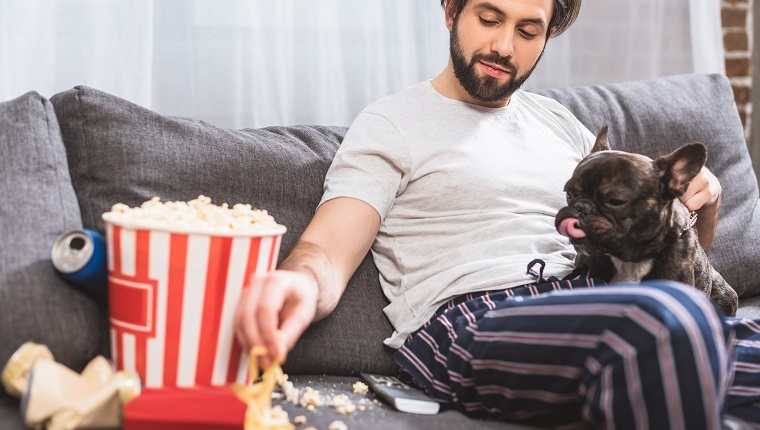 The answer to that question is technically yes, most dogs can eat a few french fries on rare occasions and be fine; however, fries are very unhealthy for dogs and have no real nutritional value. While most dogs can eat some fries, they really shouldn’t, and they’ll be better off if you avoid giving them fries at all. 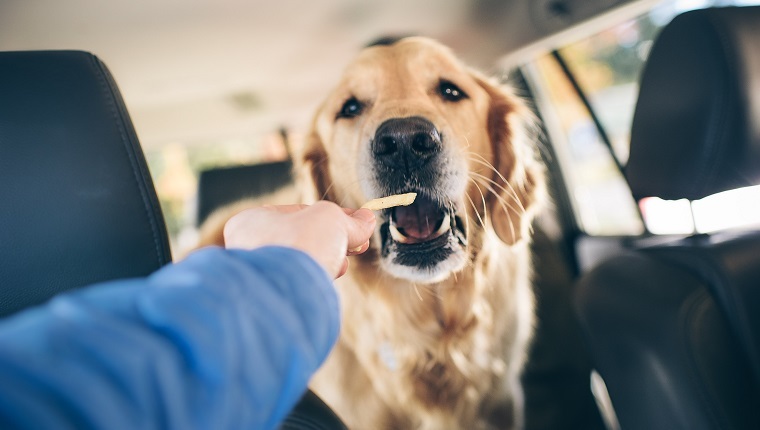 Eating french fries too often can lead to severe health consequences, and some dogs should never eat any french fries because they can get sick. You must always ask your vet before sharing human food with canines. Here’s what you should know about feeding french fries to dogs. Why Are French Fries Bad For Dogs? The typical ingredients in french fries aren’t toxic for dogs and are all digestible in small amounts, although that doesn’t mean they are good for dogs, either. 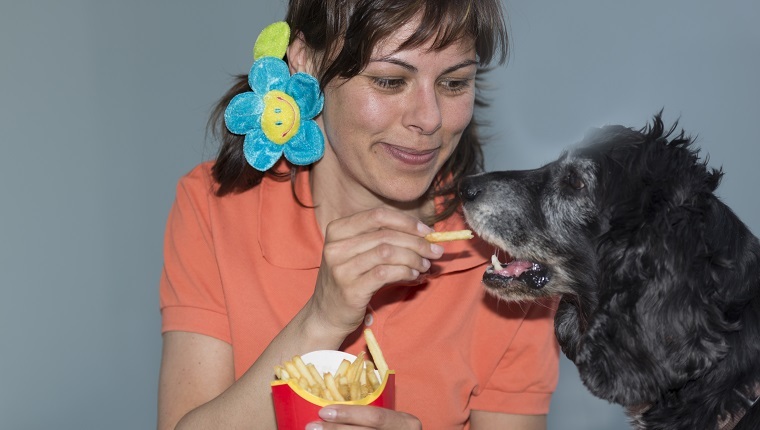 In fact, too many french fries over a long period of time can cause serious health issues in dogs. In the short term, they can also give your dog concerning symptoms. The main ingredient in french fries is, of course, potatoes. Potatoes aren’t really terrible for dogs, but they are high in carbohydrates, and those carbs are not easy for dogs’ digestive systems to process. Some dogs are allergic or sensitive to potatoes. I had a dog that would immediately throw up or have diarrhea after even one fry or chip, so some dogs absolutely can’t eat any potatoes at all. Another usual ingredient in fries is oil. Some oils, like fish oil, are good for dogs, but the oil used in french fries is typically canola or vegetable oil. This oil is not healthy for dogs and gives french fries a lot of trans and saturated fats–the bad kinds of fats. Too much fat can cause digestive upset in the short term and contribute to conditions like obesity, pancreatitis, or diabetes in the long term. Excessive fat consumption can also lead to bloat in some dogs, which is a life-threatening condition. The other most common ingredient in french fries is salt. It would probably take quite a few fries with a lot of salt on them for your dog to suffer from salt poisoning, depending on their weight. However, fries are often very salty, and that much salt can lead to dehydration, excessive thirst, and changes in urination in the short term. Long-term exposure to excessive salt can lead to kidney problems. On top of all that, some people put spices or condiments on their fries that can add extra unhealthy ingredients and even more salt. If you must feed your dog french fries, you are best off feeding them plain, unsalted fries. Even then, they aren’t a healthy treat–just a bit less unhealthy. What Should I Do If My Dog Eats French Fries? If your dog eats a few french fries, you probably don’t have much to worry about. However, some dogs are quite sensitive to the ingredients in fries, and some are even allergic. Should your dog manage to eat some french fries, make sure they have access to plenty of water. Keep an eye on them, and if your dog is having symptoms that concern you, call your veterinarian right away. Below are a few of the less serious side effects that you might see in your dog if they eat french fries. If these symptoms last longer than twelve hours after your dog as eaten french fries or they start to become extreme, talk to your veterinarian. Some dogs may suffer more severe side effects. If you see the following symptoms, it is important that you contact your emergency veterinarian immediately, as your dog may be experiencing a life-threatening condition. Severe allergic reaction. If your dog shows signs of hives, swelling, or difficulty breathing, they may be at risk for anaphylaxis. Salt poisoning. Small dogs that eat a lot of salty fries are most at risk. Symptoms include confusion, seizures, vomiting, diarrhea, fever, drunk-like behavior, and coma, among others. Bloat. The high fat in fries can cause some dogs’ stomachs to twist in on themselves and fill with gas. Large breeds are more at risk. Symptoms include swollen stomach, drooling, panting, pacing, and signs of pain. Dogs may look like they are trying to vomit, but nothing comes out. What Are Alternatives To French Fries That I Can Feed My Dog? When it comes to sharing something healthier from the drive-thru with your dog, most fast food places don’t have many great options. Even their supposedly “healthy” options like fruit can have added sugar or be treated with herbicides and pesticides. It’s probably best to leave your pup at home if you plan to get fast food. With that said, there are several healthy human foods that you can share with dogs. Regular potatoes aren’t a great choice, but dogs can eat sweet potatoes. They can also eat many vegetables, like broccoli, carrots, green beans, and more. Several fruits are also good for dogs, including blueberries, watermelons, and bananas. Some foods, however, should be avoided. Grapes, onions, garlic, and other foods can be toxic or unhealthy for dogs. Talk to your veterinarian before sharing any human foods with your pooch. Has your dog ever eaten some french fries? 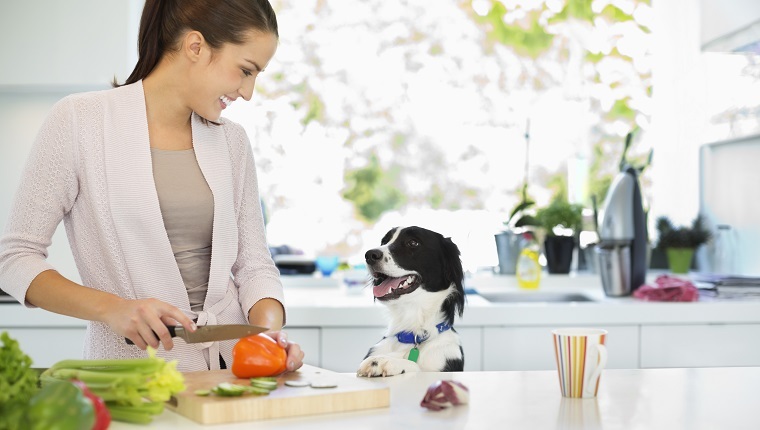 What healthy foods do you share with your dog? Let us know in the comments below!